Founded in 1962, TWK-ELEKTRONIK can look back at over 45 years of experience in developing, manufacturing and selling sensor systems for rotary and linear measurement. Our broad-based range of sensor system products is used in all areas of industrial and measurement technology applications. From labelling machines and large paper machines to camera control systems and wind turbines. We keep pace with rapid technological developments in automation technology with innovative solutions which are always oriented towards customers’ applications. These innovative solutions are developed by our highly-qualified engineering and technical teams with many years of know-how. This not only benefits our well-known major customers, but also our many world-wide customers with smaller production runs. In combination with competent advice and support, our high specialist standards ensure a high level of customer satisfaction and a strong market position with constantly increasing turnover. Rotary and linear sensors and Inclinometers. Robust, reliable and durable. We optimize our products for your specific application to reduce your system costs. In particular, applications in explosive and safety-relevant areas plus under water. Rotary transducers and pulse generators with optical scanning offer high resolutions of up to 16 bits (65,536 steps/revolution) and are insensitive to external magnetic fields. In the single-turn range, a code disk is scanned by an LED with long-term stabilisation and an optical array. The multiturn position is recorded by an optically scanned transmission. Interfaces from analogue to field buses with safety protocol are available. 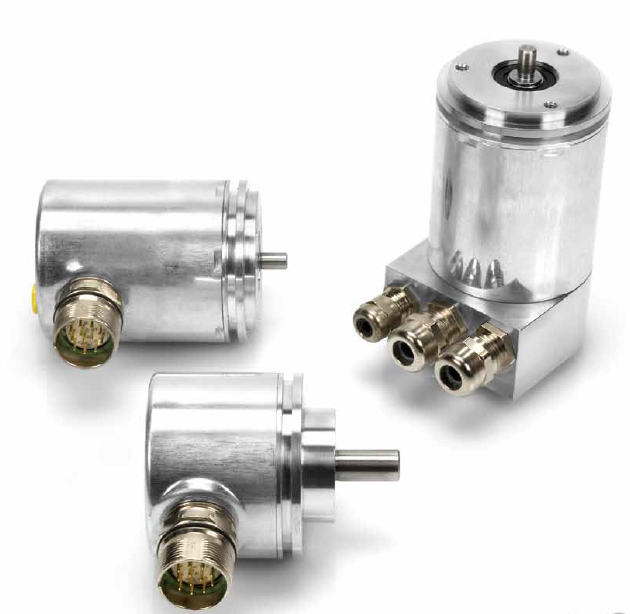 Rotary transducers with magnetic scanning are available in many different versions. From miniature encoders with a separate magnet hub to the heavy-duty dual-chamber systems with IP69K protection types or customer-specific embedded solutions. In addition to a rotary position, certain models can also output speed and acceleration values. They are available with various interfaces, from classic analogue outputs up to field bus interfaces with safety protocol consisting of a redundant sensor system. Rotary transducers with a measuring range of up to 360° are equipped with conductive plastic resistor elements. The helical potentiometers up to 10 revolutions have wire-wrapped resistor elements. For measuring lengths from 1 mm to 400 mm. The measuring principle enables freedom from wear, unlimited resolution, extensive reproducibility plus robust and watertight designs. High vibration and shock resistance for continuous operation. For measuring lengths up to 1000 mm with very high precision and repeatability. Durable conductive plastic resistor path. Design with & without return spring, cable, connector and/or ball joints. Magnetostrictive linear transducers enable contact- and wear-free displacement measurement with high accuracy. They offer measuring ranges between 0 – 25 mm and 0 – 7600 mm with linearity of up to 0.01%. Thanks to their completely encapsulated design, they offer protection types up to IP67. In addition to displacement measurement, the majority of models also enable speed measurement. Very long measurement displacement is converted into an angle using a mechanical facility. This angle is recorded using a multiturn rotary encoder. The measurement result is proportionate to the measurement displacement. Programmable rotary encoders can be calibrated according to the actual measurement stroke. The measurement signal may be analogue or digital. The cable-type displacement/angle converters are designed for strokes from 1 m to 60 m. The rotary movement of a cable drum with return spring is transferred to a multiturn rotary encoder. The stainless steel measurement cable is wound in a single layer onto the measurement drum and is tensioned by the return spring. In the toothed belt displacement/angle converters, a steel-reinforced toothed belt runs around a pinion. The toothed belt is tensioned with a spring element and engages without play into the teeth on the pinion. The revolutions are recorded by a multiturn rotary encoder and are converted into a measurement signal. The measurement signal is proportionate to the displacement. For measuring two axes up to ±90° in the earth’s gravitational field. Parameters such as the measuring range and zeroing function can be programmed in the MEMS technology-based sensor. Installation accessories for rotary encoders and linear transducers, programming devices and displays. We offer various sizes of multifunction displays to display the values measured by our linear and rotary transducers either locally or in a control panel. These can be connected to transducers with an analogue or SSI output and to potentiometers or inductive linear transducers. They can additionally be used as limit value indicators and for linearisation. Programming devices are available for various linear and rotary transducers. These serve to easily adapt the measurement range to the mechanical requirements or to set the profibus address. In addition to the accessories described in the data sheets, further accessories can be found here, e.g. : Fastening clamps, couplings, mounting brackets, measurement gears, etc.